Al Roker must have pulled some strings to stave off the thunderstorms in Raleigh, North Carolina, this morning. 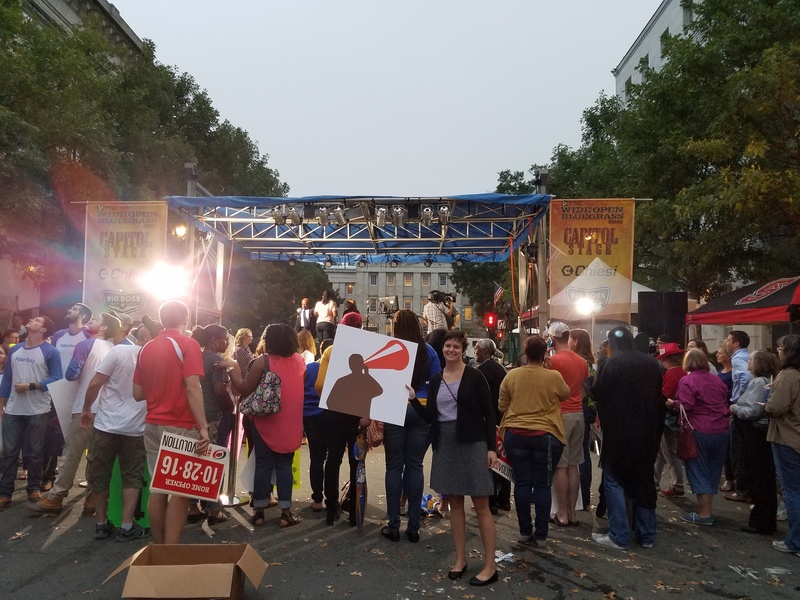 The TODAY Show came to town to kick off the Wide Open Bluegrass Festival, and local NBC affiliate WRAL-TV coordinated a warm welcome led by local meteorologist Elizabeth Gardner. In between the live weather remotes, Roker shared some laughs with the crowd that gathered on Fayetteville Street to help brighten up an otherwise overcast morning. With an opportunity to help recreate the Rockefeller Plaza-style atmosphere in Manhattan, Largemouth couldn’t resist joining the welcome committee to make Roker feel at home in the Triangle. And, he showed some local love himself. We spotted him sipping on an iced coffee from a downtown Raleigh staple, The Morning Times, and word on the street is he was able to snag a bite to eat at one of Ashley Christensen’s establishments, the famed Poole’s Diner. We can’t help but wonder if he got to try the infamous mac and cheese? The early wake-up call was worth it, if you tuned in, you may have spotted our Megaphone Man waving in the sea of posters. If you're looking for a PR team to activate your brand and increase visibility for your marketing efforts, give us a shout. Hope you enjoyed Raleigh, Al! Kelly recently traded in her suit case for a diaper bag, but she still has plans to check Spain, Iceland and Italy off her globetrotting bucket list. In the meantime, she regularly receives wine club shipments (at the office). Thanks to her adventurous palate, she is also the designated taste-tester for her husband’s delicious kitchen creations and loves keeping tabs on what’s hot in the restaurant scene. Barbecued pigtails, anyone?